Making candy is something I don’t do often enough. When I’m in the mood for some kitchen therapy, my mind just doesn’t go there. Bacon, on the other hand, my mind goes there a lot. I was working on cleaning out our freezer when I came across a pound of bacon. 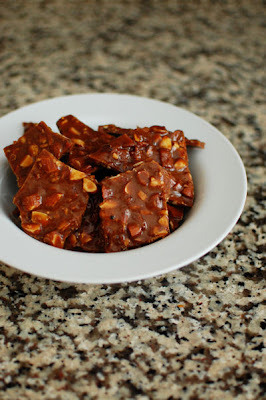 I set out to find a recipe to highlight bacon in a sweet treat and stumbled upon this Bacon Almond Brittle. I was instantly intrigued and set out to make the recipe. I cooked the bacon a couple days in advance of making the candy so that it would be quick and easy. As you can see in the pictures, my caramel came out pretty dark. I definitely burnt it a tiny bit. The clip on my candy thermometer had broken and I don’t think I was getting a good reading from it. Right when I was getting frustrated that things weren’t progressing very quickly, the color started to change very quickly. I cut the heat and mixed everything in, but it had already gone darker than I was expecting. At the end of the day, I enjoy the taste of burnt caramel, so it wasn’t a complete disaster, but if you’re more careful than I was, yours might not be this dark. 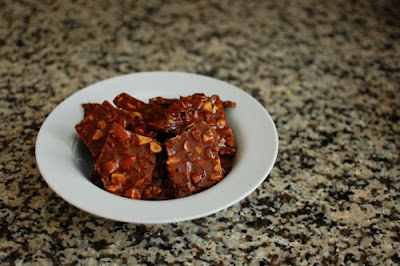 This Bacon Almond Brittle would make a great holiday gift because it makes a fair amount and would ship well. 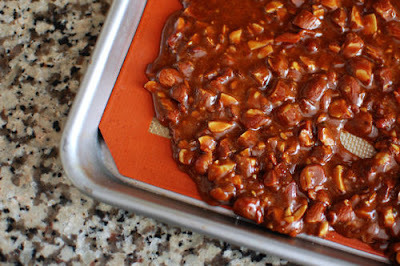 I enjoyed the combination of the smokey/salty bacon, the pepper, and the caramel in this brittle. Next time, I’ll keep a closer eye on it so it’s not so dark though! Cut the bacon into bite-sized pieces. Place the pieces in a large saute pan and cook over medium heat until crispy, about 10 minutes. Drain on paper towel-lined plate and set aside. Line a baking sheet with a Silpat, waxed paper, or parchment paper---set aside. Combine salt, baking soda, and pepper---set aside. In a large saucepan, combine the sugar, corn syrup, and water. Cook this mixture on medium-high heat for about 4 minutes, or until the sugar turns thick and syrupy. Slowly add the softened butter and continue stirring until the mixture emulsifies. Keep cooking and stirring until all the water has boiled off and mixture is golden brown, between 300°F (150°C) and 320°F (160°C). Remove the pan from the heat. If the mixture is not smooth, whisk until it is smooth. Stir in the baking soda, salt, peppercorns, crispy bacon bits, and almonds. Quickly but carefully pour the brittle onto the prepared baking sheet. 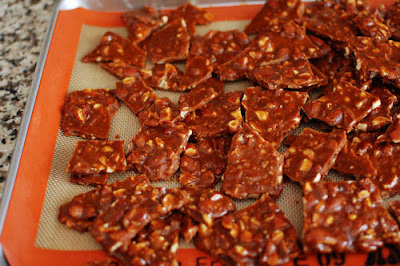 Once the brittle has cooled and hardened, break it into bite-sized pieces or larger chunks. Store in a tightly sealed container for up to 1 week. If nothing else, make the pulled pork – it’s amazing. With the slaw it’s even better!